What do you need to do before house cleaner arrives? Before house cleaner arrives, do as much as you can too, if possible. Although it’s true that you are paying them to do home cleaning and it may not make sense to do their job for them. But for real, your responsibilities as the owner of the property is not even that much. Moreover, being the customer as you are, you also have a responsibility for your own customer experience. Sometimes the culprit for bad customer experience is also the customers themselves. Often, it falls to lack of attention to details, neglecting terms and conditions and miscommunication with service providers. Prevent dissatisfaction from cleaning services by taking your part in the process. Do your own responsibilities before your house cleaner arrives. This is one way to ensure that there will be no problems after your house cleaner leaves. Although organising your house is a part of their responsibility, you might just want them to focus solely on cleaning. Especially, if part of the clutter is important documents or possessions that you don’t want to be misplaced. Better sort them out and put them in places where you can easily find them. It’ll be really hard for your cleaner to distinguish between your work documents and rubbish. So better keep them all in your cabinets yourself before house cleaner arrives. Also, as much as how the cleaning company reassures you of the cleaner’s credibility, it would be to the benefit of ever to zero out contingencies. This should be obvious enough. And it’s not a question whether or not your cleaner already gained your trust or otherwise. It is a matter of care for your own valuables. You really don’t want to end chasing your cleaner because of lost items. And be awfully furious to an impasse that is still subject to clarification and investigation. It’s better to remove motive early on. So, therefore, keep your valuable possessions secured before house cleaner arrives. If the house cleaner is fresh from the agency and you do have pets, then it is your responsibility to ensure their safety. So, mind your pets before your house cleaner arrives. As someone who’s hiring other people to clean your house. It’s obvious enough that at the end of the day, you may want to make sure that all your stuff is good. And nothing is missing. But you will not get 100% certainty unless you know every piece of possession that you need to be checking. Ergo, it’s best to keep an inventory of stuff that was there before house cleaner arrives. Then check the inventory at the end of the day and ensure that everything is still in place. Cleaning is much easier if the areas that need intensive cleaning are already identified. Especially if you are a meticulous employer. It’s best if you leave a note to give instruction to your house cleaner. Let them know the areas which need their close attention. Even how busy your day is and no matter how much you are in a hurry, you need to ensure that your cleaner will be able to enter your premises. Or most especially, if you are going out of town. Leave your house cleaner access to your house early on to avoid forgetting it when you’re already rushing off to your vacation. All these guidelines are also for your own safety. Especially if you are someone who hates errors. And finds it hard to trust people easily. 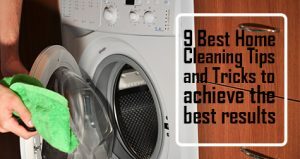 So, it would be the benefit of everyone if you do these preparations listed in this article before house cleaner arrives. Do you want to check out more insights from the pros? We will update our blog with the latest innovations in the cleaning industry. So, check it out every now and then. And call us for your enquiries 1300 707 692. Want to learn some best home cleaning tips from the experts? Then read our previous blog on the best home cleaning tips. This entry was posted in Home Cleaning and tagged cleaning tips, home cleaning services, Maid in Perth, quality cleaning services.